Kids find cattails fascinating to collect, hold and touch, and using cattails in crafts are a wonderful way for children to work with them. Cattails are perennial plants that grow abundantly in areas where the soil remains wet--marshes, swamps, wetlands, bogs, ponds and rivers. They can grow up to 6 feet high and have a velvety brown puffy cigar shaped "tail" that sits atop sturdy light green stalks. 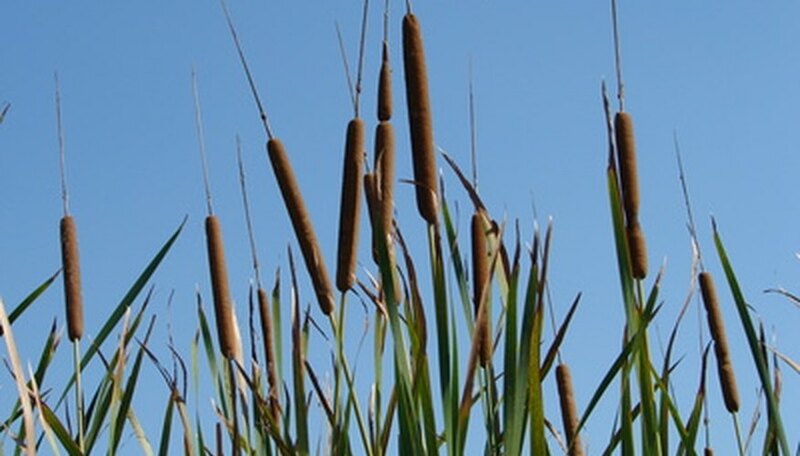 In its natural state, the puff part of a cattail reed is brown. This easy kids craft brightens things up a bit before arranging the cattails in a festive bouquet. Materials needed include 10 to 20 cattails, stalks attached, green, burgundy and dark purple spray paint and a vase. Clip the cattails so that they are all about the same height. Hold one by the end and thoroughly spray the velvety puff section. Allow to dry while resting in a vase. Spray the other cattails in the same manner, alternating colors. Painting the cattails not only makes them beautiful, but it preserves the cigar-shaped tail, which is actually a seed pod that will explode into fluff when it gets too dry. Arranged the colorful cattails in a vase or pot. Native Americans had many creative uses for cattail leaves, which they often used to weave floor and place mats. Kids will enjoy this craft, which makes good use of the plant's less showy attributes. Material needed includes fresh cattails, a rectangular piece of cardboard, scissors, thumbtacks and glue. Collect long leaves from the plant and lay them side by side so that they cover the cardboard. Thumbtack the anchor leaf so that it doesn't slide around while you are working and weave the other long leaves back and forth between the set leaves until the mat is covered in a crisscross pattern. When the cardboard is completely covered, trim the ends of the leaves, then use a little wood glue to hold the edges of the leaves to the cardboard. Bookmark crafts help kids preserve and use the cattails they have collected. This project turns out best if a laminating machine is used, but a steady hand and heavy-gauge clear packing tape can also work well. The child will need four to six cattails, depending on their size. Trim the cattails to about 6 inches a piece. If using a laminator, lay the cattails side-by-side, alternating the end that the puff is on, on one piece of laminating paper, then cover with the other piece and run slowly through the machine. Trim carefully around the edges of the cattails to finish the bookmark. The same design can be used with the packing tape. Weight the bookmark under some flat, heavy objects overnight. Cattails can also be used to paint by pinching or smashing the puffy ends until they fray apart a bit. Use the brushes in thin paints to create pictures or patterns on paper, wood or ceramic projects. While the brushes cannot be re-used, this is an interesting craft for young kids who want to create with this beautiful unique plant.